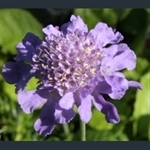 The scabious are lovely summer-flowering perennials, the larger ones suitable for the herbaceous border, the smaller ones at home in the rock garden. All like open sunny sites and well-drained soil. The flowers are characteristic, with a central zone of florets with prominent stamens, surrounded with rays, the prominent metals making the flowers quite showy. The whole flower is the same colour, usually in the lilac to pink range, but there are some pale yellow ones. Dwarf scabious making mats of foliage with short-stemmed, large blue flowers. Deeply toothed pinnate leaves with blue flowerheads with ray-like outer florets.